Basic knowledge of SMT technology rules will prevent the problems during assembly, it will improve the quality of products and make the production cost effective. All technological equipments like pick & place machines, soldering ovens, machines for paste deposition, soldering wave and optical inspection machines are equipped with transportation conveyor that clamps the boards of a rectangular shape or at least boards with two longer sides that have to be parallel. * Picture shows the transport conveyor of a pick & place machine. You can see there the clamping pins and stopper. With those the board is stopped at the assembly position and clamped by two parallel sides. Exceptionally it is possible to clamp irregular shape e.g. PCI card. It is not possible to clamp the PCB with dimensions below 55x55mm. In this case the board is multiplied-panelized to an appropriate dimensions. The standard max. size of the PCB that we can assembly is 510x440mm. The ideal size of PCB for assembly is from A5 to A3 size. 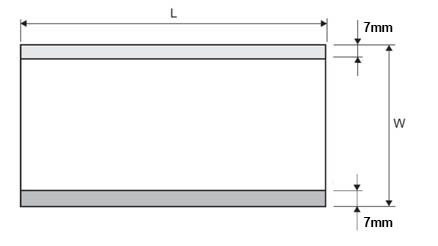 Multiple panel size depends on: thickness of the board, shape of the board, type of components. If the board is thin (0.1 to 0.6mm) the format A5 is recommended. This also is valid for routed panels where single pieces are hanging on bridges. The panel should be rigid enough to prevent considerable bending, the number and width of bridges should be correspondingly designed. Panel with PCB thickness from 0.8 to 1.2mm can have the size of ~A4. If the PCB thickness is from 1.6 to 3.2mm thick panel can approach the size ~A3. Mechanical rigidity is a criterion. Further limiting factor of panel size is the accuracy and density of components on board. If components are 0805 up and the smallest pitch is 0.65, the panel size of A4-A3 is feasible. If the components are smaller e.g. 0201-0603 and pitch 0.3 to 0.5mm the smaller panel size is preferable ~A5 to A4. With larger panels the complex accuracy and charge for stencil mask can be an issue. The price of the stencil depends on number of pads, for high density panel it might be more expensive. If the single board is large enough (larger than 55x55mm) and has enough components (more than 100pcs), it is possible to assembly them piece by piece. In this case it is necessary that the longer side of the board does not contain components that are located closer than 3mm from the edge of PCB. Either panel or single pieces should have the fiducial marks. Fiducial marks serve for exact positioning of components on PCB. 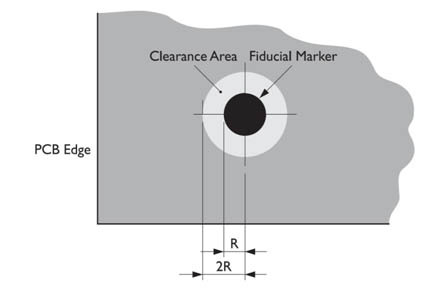 Each technological machine in production needs fiducial marks for optical alignment. The fiducial marks are automatically checked by camera and that way the precise position of the board in conveyor is known. Detection of fiducial mark position is based on reflection of Coper surface compared to matt surface of PCB substrate. The matt surface around the fiducial mark should be large enough and without any other Copper disturbing patterns. For a perfect alignment we would need at least two fuducials in distant corners of the board and at the same time the fiducials should not be closer than 3mm to the edge of the board or panel. If there is no space for fiducials in the active part of the board they can be located on breakaway tabs around the board or the fiducial can be located even under the larger package of the THT component. If it is located under SMT component, it will not be visible at AOI inspection machine after SMT components are assembled. Ideal fiducial mark shape is a solid circle of 1mm diameter without drilled hole and with 2mm solder stop mask opening. If you have space you can put more fiducials on the board. Operator will select the most suitable ones during the setup process of assembly. If the panel contain more single pieces, you can put one fiducial to each single motive or two fiducials to breakaway tabs around the panel or both. 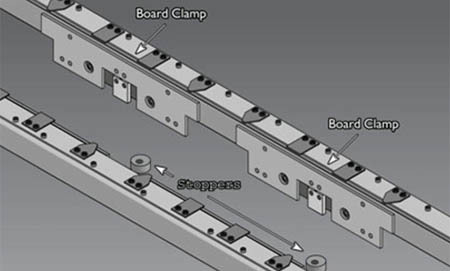 The role of the technological area around the board (parallel breakaway tabs on longer sides of the board) is to ensure the clamping and transportation by conveyor. It is necessary in case the components are too close to edge of the board. If the components are located more than 3mm from the edge of the board and two longer sides of the board are parallel the board does not need the technological area around. The necessary space along the longer sides of the board is min. 5mm. If this is not feasible with the board itself, the technological area (breakaway tabs) along the longer sides of the board or panel should be added (7mm wide). The breakaway tabs can be separated by V-cut or routing with bridges. After assembly is done the boards are divided using cutting machine in order to prevent the mechanical stress to boards and components. For more effective production board usually is assembled in multiple panel. Technological area (break away tabs) is a part of the panel that also solves fiducial marks and components that overlap the edge of the boards. In PCB production usually boards are produced in panels, nevertheless, it is necessary to define the panel that will be compliant with the assembly setup (thickness, V-cut or routing) and it is necessary to let the production know that the boards should not be separated after bare PCB production. PCB manufacturer hardly can propose the optimal panel setup from data of bare PCBs, it is necessary to consider the components too, but this is not visible for PCB manufacturer. The correct panel setup should respect the overlapping components, easy division of boards after assembly, rigidity of panel. Therefore, it is fruitful to check and consult the panel design prior to PCB manufacturing. Below you will find the brief recommended checklist that has to be applied prior to PCB production. the board has to have a unique name and version. Gerber files of each PCB side that has to be SMT assembled, layer for paste stencil and mechanic outline of the board with component outline if available.